"Why do they bother nominating short films if nobody sees them?" I get asked this almost every year at Oscar time. Well, now everybody can see them. For the past ten years, ShortsHD™ has been partnering with Magnolia Pictures to bring the Oscar-nominated short films out of obscurity and into the mainstream for all to enjoy. This year, over 450 theaters will be screening the films. Last year, the programs grossed an impressive $2.4 million at the U.S. box office. Why the interest in short films? There are plenty of Oscar completists out there who make a point of seeing every movie they possibly can before the big show. By seeing the nominated short films, one might have a slight advantage in the big office pool. Not only that, but short films remain a great way to discover new talent in its infancy. Past short film winners have included John Lasseter, Peter Capaldi, Jim Henson, Don Siegel, Taylor Hackford and Steven Wright. But the best reason to see a collection of short films is to uncover different modes of narrative storytelling and experimentation by artists unencumbered by the forces of marketing, studio politics, tried-and-true formulas and/or genre conventions. In the Best Live Action Short nominees, Oded Binnum and Mihal Brezis' Aya (40 min.) tells the story of a woman who assumes the identity of a limo driver at an airport and who ends up driving a music professor to Jerusalem. The majority of the film takes place in the car as the two slowly become friends and the truth comes out about her real occupation. The film eloquently depicts the fruition of a real friendship with the final moment revealing just enough clarity and depth that a feature film would have otherwise belabored. The two performances are outstanding. On a lighter side, Michael Lennox's charming Irish film Boogaloo and Graham (14 min.) takes place in 1978 Belfast, but instead of focusing on the Troubles, it tells the story of two brothers whose father buys them each a baby chick, whom they immediately treat like family. But can they keep them? Usually the Oscar goes to the most light-hearted of all the live action films. If that's the case this year, this would be a safe bet as the winner. I had the privilege of programming Wei Hu's Butter Lamp (15 min.) at the 2014 Chicago Critics Film Festival. At the time, I was never quite sure if Hu had made a documentary or fictional narrative. In it, a photographer takes pictures of Tibetan nomads against backdrops of famous monuments and Disney characters, with sometimes surreal and funny results. The film is less a narrative and more of a statement on the inescapable modern world. Talkhon Hamzavi's Parvaneh (24 min.) continues this year's theme of meaningful encounters when a young Afghan woman arrives in the Swiss Alps to start a new life, but needs the help of a civilian to send a Western Union money order to her ailing father back home. She meets a rebellious teenage girl who shows her around. The film sets itself up for so many possible tragic endings and Hamzavi thankfully resists all of them. Finally, The Phone Call (21 min.) features Sally Hawkins as a crisis hotline operator who answers a distressing call from a man on the verge of death. The voice belongs to Jim Broadbent, who is never seen, but gives one of his strongest performances ever. The same can be said for Hawkins. Look also for Fawlty Towers' Prunella Scales in a cameo. The film is undeniably moving, at least until its final moments, the sentimentality of which almost brings about the collapse of the entire thing. Almost. The Best Animated Shorts by themselves totals about 47 minutes, but as has happened previously, there will be four more shorts added to the program to bring the total to about 77 minutes (I have not seen those added films). With a 3-D look that has the precision of an Aardmen film, A Single Life (2 min.) depicts a woman with the ability to skip through time via a needle on a record. The further the needle gets to the center of the record, the older she gets. You may have already seen Disney's Feast (6 min.) when it played before Big Hero 6 this past fall. 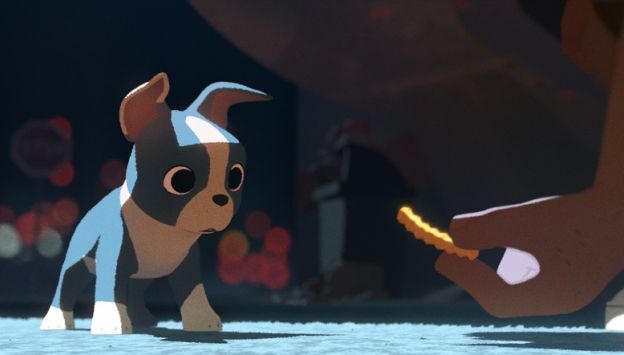 Patrick Osborne's tale of a dog, its owner and all the food that falls to the floor throughout the dog's life was the more memorable of that double bill and upon second viewing, it remains hard to imagine anyone not getting choked up during this film. After the sublime Paperman, the innovative Get A Horse! and now this, Disney's short film offerings have become a yearly treat. Torill Kove's charming Me and My Moultan (13 min.) has a simple 2-D look appropriate for the young protagonist's world view. Narrated by the middle sister of three girls, she dreams of getting a bicycle for her and her siblings, but her out-of-the-ordinary parents do not have the means. Also delving into themes of the family dynamic is Daisy Jacobs' beautifully realized The Bigger Picture (7 min. ), which utilizes real-life sets and 2-meter high characters that seem to be born from classic paintings. It tells the story of two brothers and how they cope with their mother who refuses to get care outside of the home. Disney's Feast might be the favorite to win, but it would not surprise me if The Dam Keeper (18 min.) took home the prize. Robert Kondo and Daisuke 'Dice Tsutsumi's lovely film is made up of 8,000 paintings and tells the story of a pig who runs a dam that keeps the town where he lives from being overly polluted. But he also gets bullied at school and has no friends. When one shows up, it changes everything. A beautiful piece of work. The Best Documentary Shorts, which screens in two parts, offers a surprisingly apolitical collection of films that focus on thankless occupations and family hardships. Ellen Kent's Crisis Hotline: Veterans Press 1 (45 min., also available on Amazon Prime) uses talking heads and statistics sparingly and offers profiles of several operators who help talk war veterans out of suicide. We never hear the veterans' voices, but we do get a clear sense of urgency and turmoil. You know you're watching a great short film when you wish it were a feature. That's how I felt when watching Aneta Kopacz's Joanna (40 min. ), a stunningly intimate and unconventionally constructed piece about a mother with cancer and her relationship with her insightful 5-year-old son. Tomasz Sliwinski's Our Curse (27 min.) could well be Joanna's flipside, as Sliwinski chronicles he and his wife's struggles with their newborn infant who has a rare disease whereby he depends on a breathing apparatus during sleep. Sliwinski's film is basically a home movie, but the daily internal battle within one's self to put on a happy face in spite of it all becomes a worthwhile theme and one that will deeply resonate with anyone who watches it. At 29 minutes, Gabriel Serra's The Reaper still feels a bit long in the tooth (the similarly structured and themed Paraíso accomplishes the same feats in 10 minutes). Still, this unflinching film about a man who has been working in a slaughterhouse for 25 years contains some haunting imagery and the central character, a bull killer, has interesting justifications for his chosen line of work. Finally, Christian Jenson's White Earth (20 min.) focuses on the lives of three children and an immigrant mother in South Dakota as the men in their lives work the oil fields for weeks at a time without seeing their families. Jenson's film has a lyrical tone that evokes Days of Heaven and early David Gordon Green films, while also giving a clear sense of internal and external emptiness and despair felt within the landscape and the people who occupy it. The Academy Award nominated short films open theatrically on January 30th, 2015. Find a theater near you here.